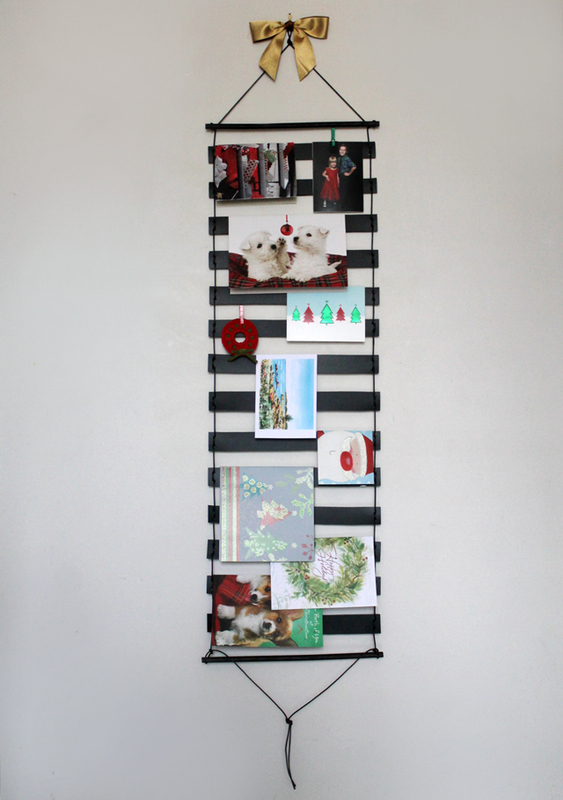 Do you need a good way to display the greeting cards and photographs you receive at this time of the year? I used to slip ours through the slats in the wooden window blinds, but that made it hard to open the blinds, and during these darkest of dark days we want those blinds open to let in as much sunlight as possible. 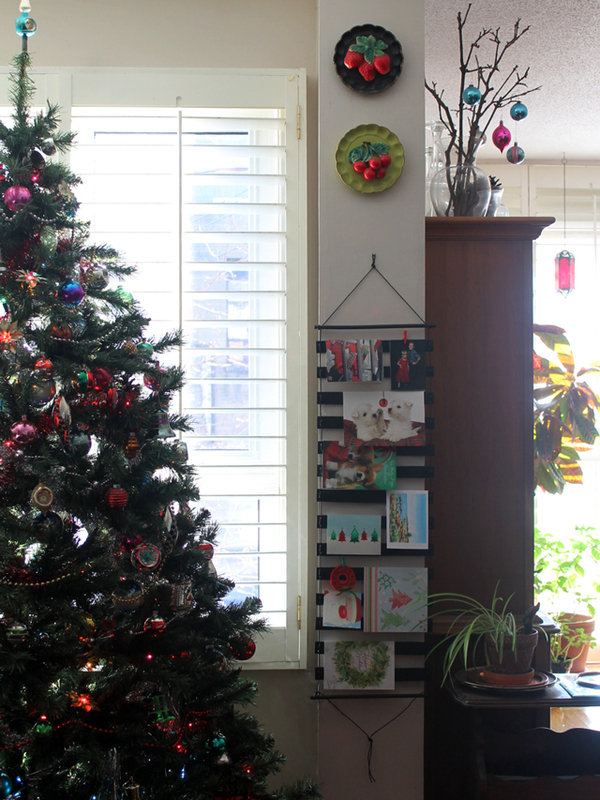 So the scattering of Christmas cards on the floor beneath the window in the living room was a normal occurrence, after the blind they'd been hanging on had been flipped the wrong way. 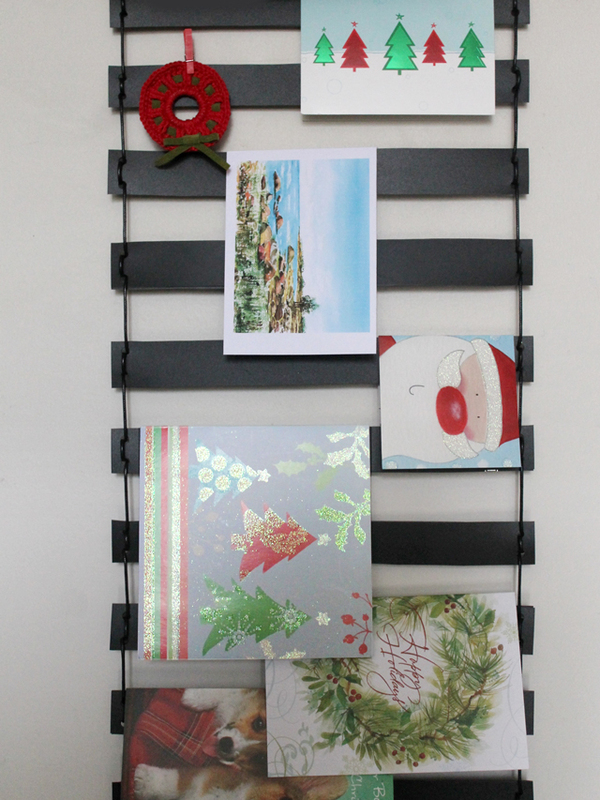 So I set out to make an alternative way to hang the lovely cards we received from friends and family. Since the wooden blinds worked well, (except for the inability to open the blinds mentioned above), my thinking was along those lines. I also wanted something that wasn't too Christmas-y so I could use it at other times of the year for birthday cards, Thanks You cards, etc, and that would be easy to store and didn't take up much space when not in use. 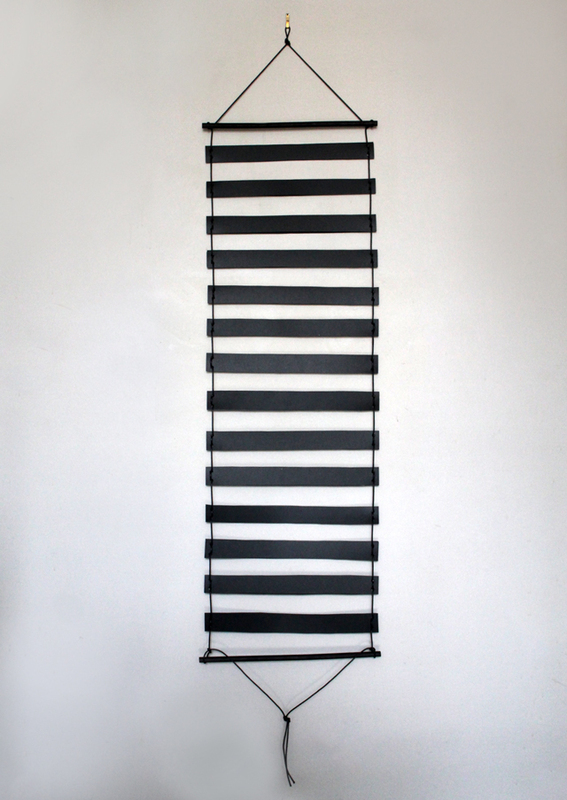 - 1 or 2 Thin plastic binders - I used two binders to make mine, that has 14 rungs, making it about 4 1/4 feet (almost 1.5 metres) tall in total, but you can make a shorter one using only one binder that will have 7 rungs. I got my binders in the stationery section at Dollarama. They come in a variety of colours so this doesn't have to be all black. 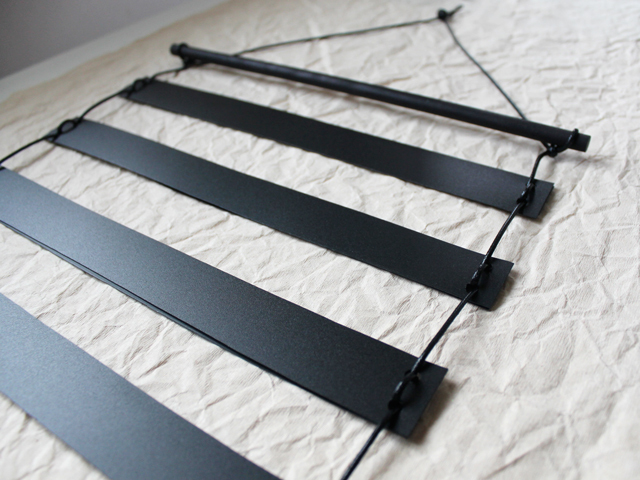 Note - each rung takes two strips of plastic, because the plastic is flexible so you need the sturdiness of two pieces. 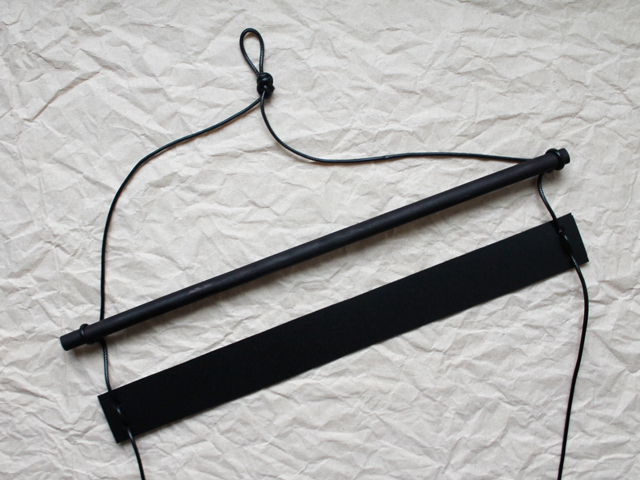 - Some cord or yarn - 3 yards (about 2.75 metres) for the 14 rung version and 2 yards for the shorter one. I found this plastic coated cord at a bead shop. - 2 wooden 12 inch dowels. - Paint or a permanent marking pen to colour the dowels (optional). 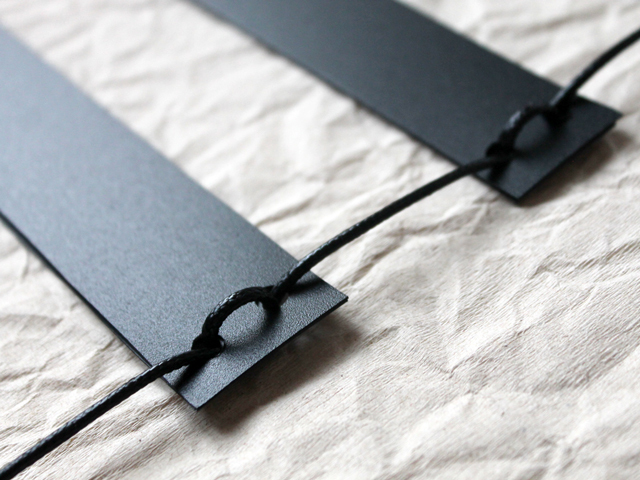 - A pencil, ruler, scissors, hole punch and a bit of sticky tape. 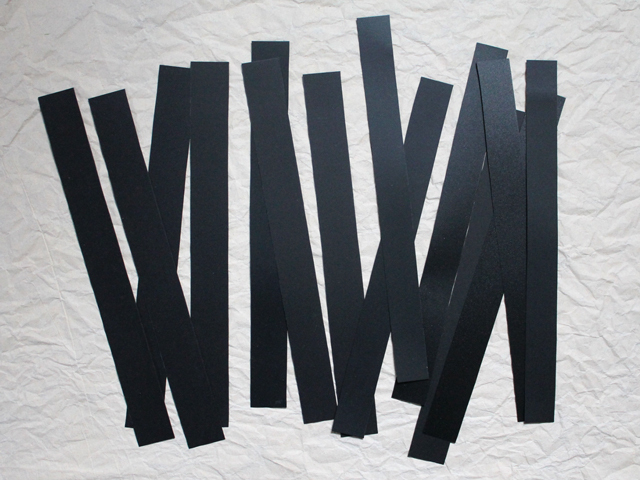 - Two sided tape (you might not need that) . 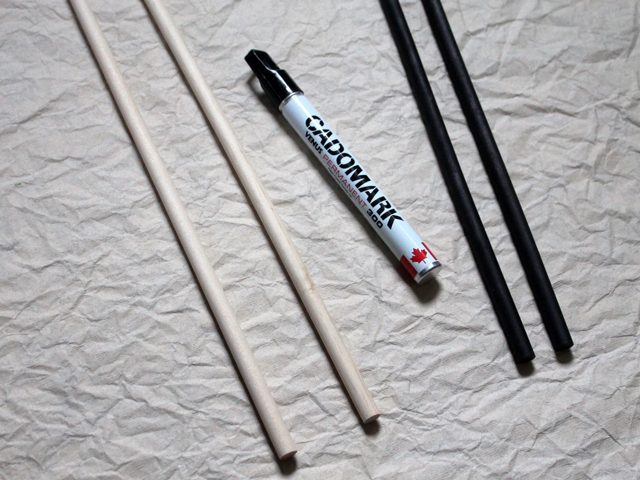 1) If you want your wooden dowels to be painted or "dyed" with the ink in the marking pen, than colour those first. 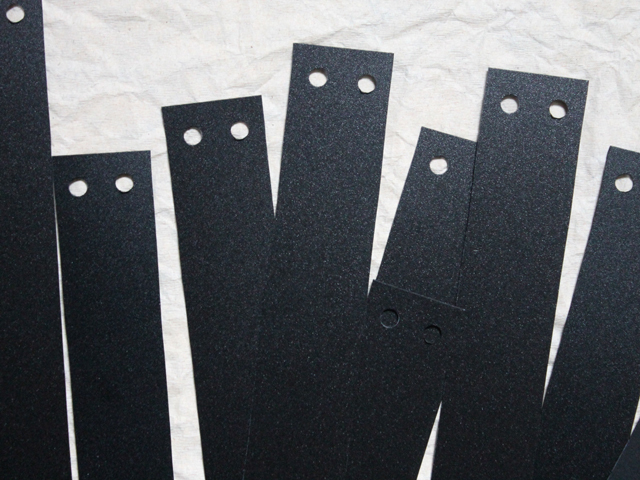 3) Punch two holes at each end of the strips. 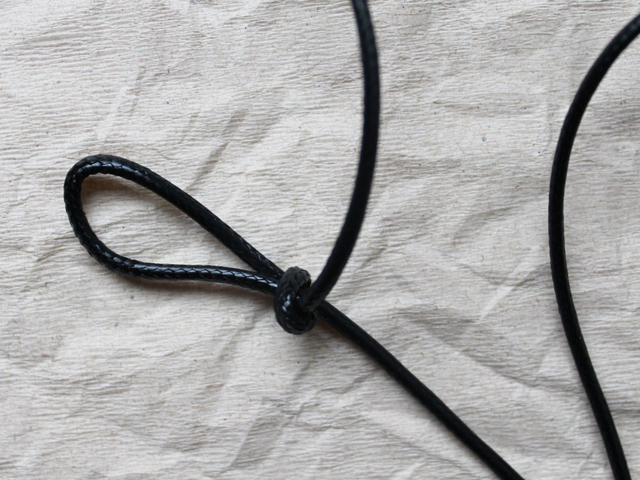 4) Fold your cord in half to find the centre point. Then make two slip knots about 10 inches from the centre, so about 20 inches apart. (It's easier to centre your top loop if you make the slip knots first, because it's hard to make those exactly where you want them. Being a little off, won't matter, and then you can make the top loop right in the middle.) Tie your top loop. 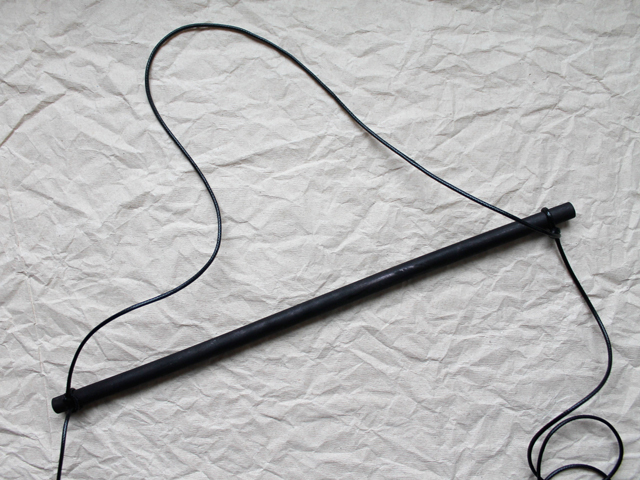 Insert one dowel through the two slip knots, and pull them as tights as possible to lock the dowel in place. 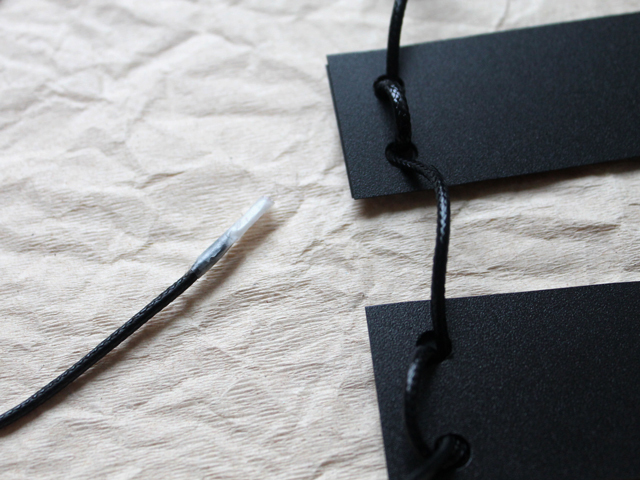 5) Begin adding your rungs by threading the cord through the top holes of the first pair of plastic strips, going through from the front. So, again, each rung uses two plastic strips, in order to make the hanger more stable. Come back through the bottom hole. To lock the rung in place, loop back through the top hole and out again through the bottom. (See the picture to get what I'm trying to say!). Do the same on the other end of the rung, and fiddle with the loops to make sure the rung is hanging straight. Proceed to add all the rungs this way. If the end of your cord or yarn frays, wrapping it in a small piece of sticky tape will make it easier to thread through the holes. 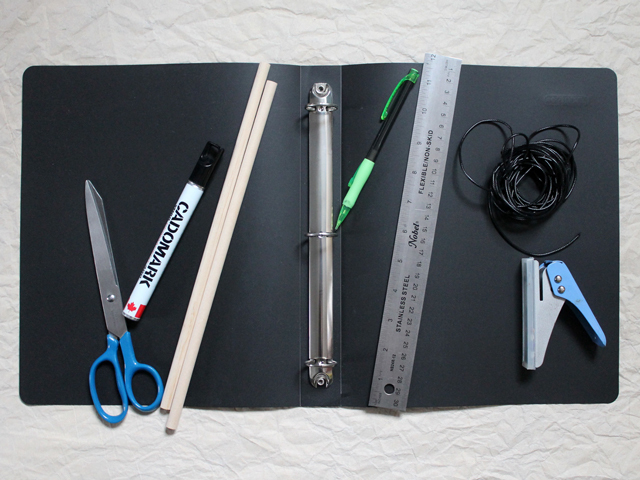 6) Attach the second dowel with two slip knots, just as you attached the first one. 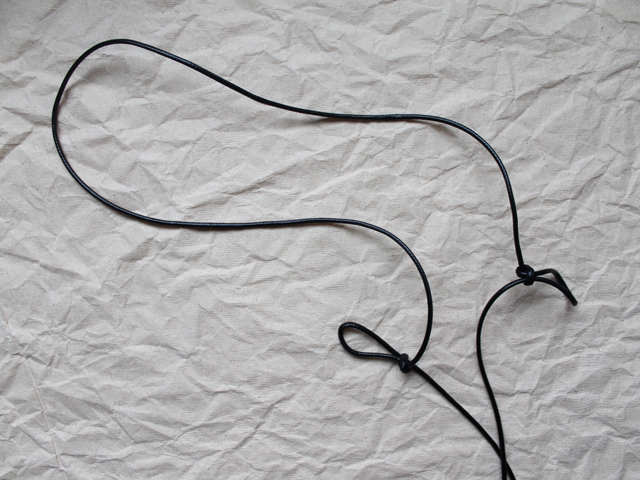 Tie the ends of the cord together in a knot and trim. 7) If some of your rungs gap open (because they're two pieces of plastic each) use a bit of two-sided tape between them to stick them together. 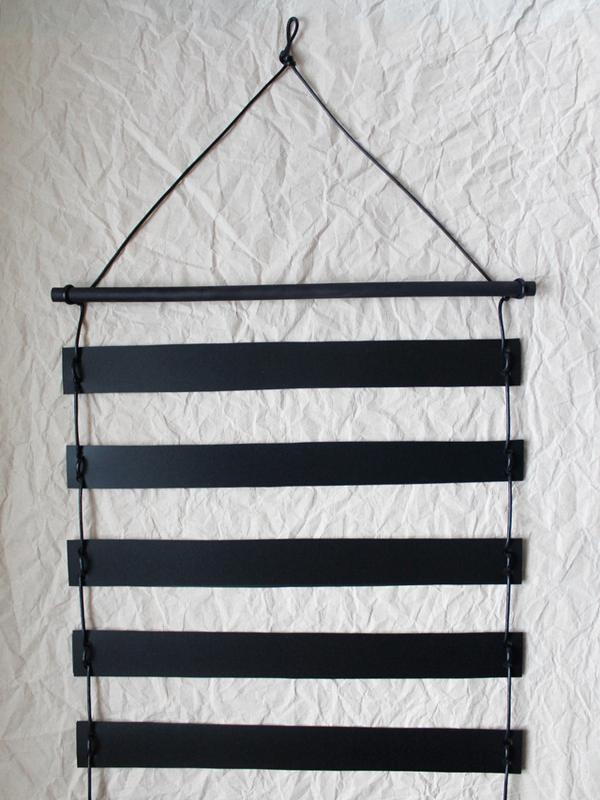 8) Hang on the wall and decorate the hook with a bow or ornament if desired. 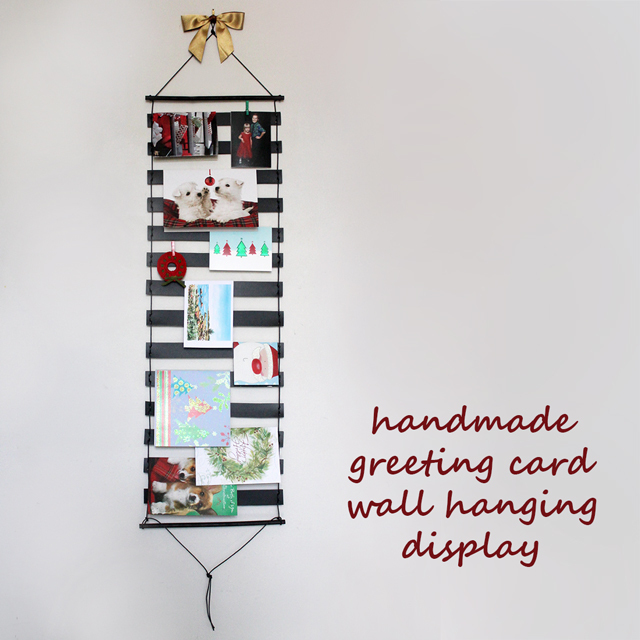 Add your greeting cards as you receive them. 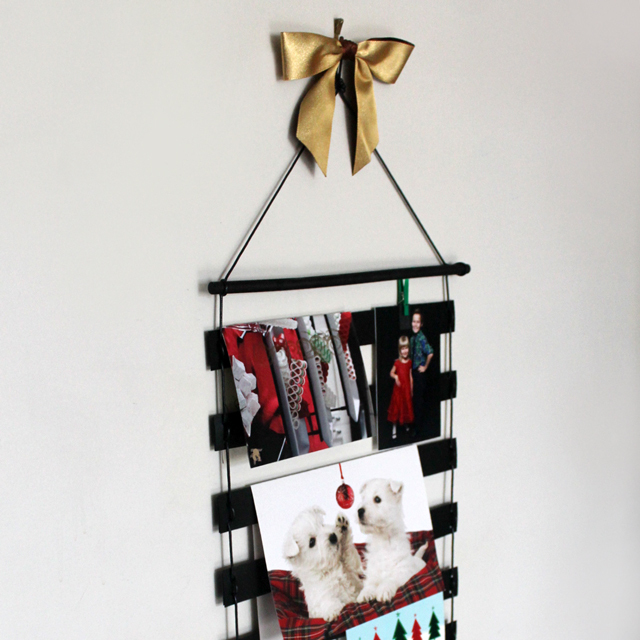 Photographs and small decorations can also be added with tiny clothes pegs. Thanks for checking out my post. If you celebrate the holidays at this time of the year, I hope you're having a lot of fun so far! Such a wonderful idea ! Christmas tree is looks so lovely too. what a clever idea!! Perfect for those of us without blinds.